You are about to enter the world of small things. A living world so small that rulers are useless. 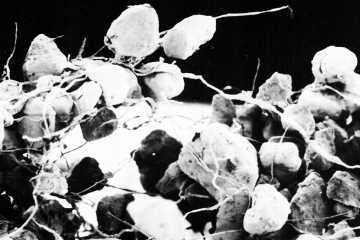 These tiny organisms form a thin crust on the surface of soils throughout the world. Although they are often overlooked and underfoot, biological soil crusts deliver essential goods and services to many ecosystems, including the Sonoran Desert. Scanning electron micrograph of cyanobacterial sheath material sticking to sand grains, x90. In this thin world lives cyanobacteria, one of the oldest forms of life. Cyanobacteria are microscopic threads of single cells of life that can photosynthesize and they can take nitrogen out of the air and "fix" it for other living things to use. In other words, cyanobacteria make fertilizer out of air. When moistened, each thread of cyanobacteria produces a sheath of carbon-laden mucus and starts to move through the upper ¼ inch of soil where sunlight is available. The sticky sheath binds together soil particles. The old and new sheaths form an intricate web of fibers in the soil, forming a crust that is surprisingly resistant to wind and water erosion. Layers of abandoned sheaths built up over long periods can be found clinging tenaciously to soil particles deeper than 7 inches in sandy soils. 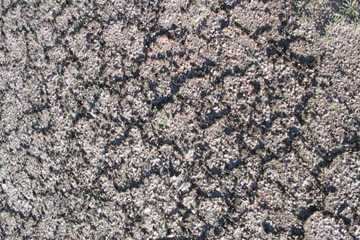 This photo shows the polygonal plates formed by soil crusts on CPNWR. Green algae, bacteria, fungi, lichens, liverworts and mosses live with cyanobacteria in the soil crust. "Old growth" crusts are diverse and stable communities formed over decades or perhaps centuries. You can see soil crusts by getting down on your stomach and looking closely. Pick up the top-most few millimeters of soil and look for minute filaments: these are the sheaths of cyanobacteria. Also look for the telltale black dots or pads of lichens and the emerald green (when wet) mosses. 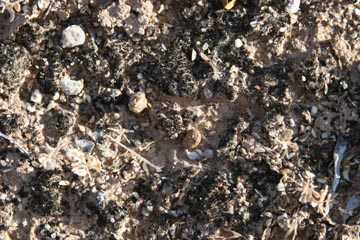 Soil crusts can look scabby (the common type in the Sonoran Desert) or they can get really elaborate with small spires, like on the sandy soils of the Colorado Plateau. 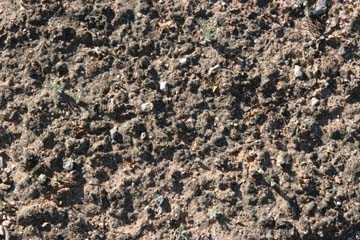 When the soil surface is covered with small stones, look for soil crusts between the stones. This is a simple crust, probably one forming after a couple decades of recovery from livestock grazing. Cabeza Prieta National Wildlife Refuge has some astonishing soil crusts. The scabby-black crusts form a striking contrast to the white, granite-derived soils found on many of the open basins in Cabeza Prieta. Sometimes, the crust forms hexagonal or octagonal plates. Look for mosses on shaded drainage banks or under trees. Crusts are lacking on the semi-stabilized dunes of the Pinta Sands and other places where the surface moves frequently and buries the crust. Here is a well-developed crust with black lichens. Notice the seeds scattered around the surface. Seeds get caught in the microtopography of the crust and don't get washed away by rain. When wet, the crust provides a moist, nutrient-rich bed for seeds to germinate. Organisms living in the soil crust not only fertilize the soil, but stabilize the soil surface as well, retarding the effects of erosion. The sheaths of cyanobacteria can absorb up to ten times their volume in water. The roughened surface of the crust slows the runoff of rainfall, increasing the amount of water that soaks into the soil. In some areas, soil covered by a biological soil crust dries less quickly than soil without a crust. Plants growing in crusted areas have higher concentrations of many essential minerals and nutrients (like potassium, iron, nitrogen, and phosphorus) than plants growing in areas without crusts. By stabilizing the soil and increasing soil moisture, aeration, and nutrients, the tiny world of soil crusts might be affecting the abundance, diversity, and health of plant species. Many human activities negatively affect biological soil crusts. The microscopic cyanobacterial sheaths are no match against footprints (cows or people) or vehicles, especially when the crust is dry and brittle. Squashed crusts contribute less nitrogen and carbon to the ecosystem. Impacted soils are susceptible to wind and water erosion. Wind not only blows pieces of pulverized crust away, the loose, underlying soil particles blow away, too. 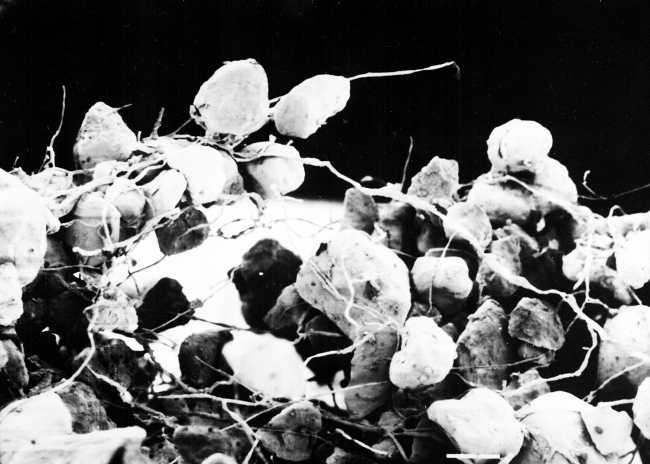 These errant particles can land on nearby crusts, which can be killed if covered. The dust raised by vehicles on dirt roads can kill crusts as well. Large areas that are impacted may never recover in our lifetime. Under the best circumstances, a simple veneer of a crust may return in five to seven years. Even a single footprint has a long-lasting effect: nitrogen fixation stops and the sheath material underlying the surface cannot be repaired because soil crust organisms live only near the surface. Like the restoration of any degraded system, restoring soil crusts is time-consuming, expensive, and usually requires more knowledge than we have at present. The best way to manage the biological soil crust is to protect it from degradation and destruction. You can help by driving only on designated public roads and by staying on hiking trails. If you are hiking off a trail, try to minimize your impact by walking on rock or in washes. When camping, minimize your zone of impact.